HAMPTON, Va. (Nov. 15, 2017) – Hampton University is joining the Big South Conference, effective July 1, 2018, after a 22-year relationship with the Mid-Eastern Athletic Conference. The announcement will be made at an 11 a.m. joint Hampton University/Big South press conference at Hampton University’s Student Center Theater. Big South Commissioner Kyle Kallander couldn’t be more excited for the conference and for Hampton University. 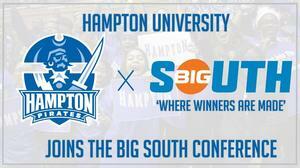 The Big South’s president is pleased to add Hampton University to the conference. The Pirates sponsor 17 sports at the Division I level, 16 of which are sponsored by the Big South: football, men’s and women’s basketball, women’s soccer, men’s and women’s cross country, men’s and women’s tennis, men’s and women’s indoor and outdoor track & field, softball, men’s and women’s golf, and women’s volleyball. Only men’s lacrosse will not compete in the Big South. Hampton’s athletics history dates back to the mid-1970s and includes memorable NCAA Tournament moments in 2001 when the No. 15-seeded Pirates upset No. 2-seeded Iowa State, as well as in 2014-15 making consecutive NCAA Men’s Basketball Tournament appearances. The women’s basketball team has won five Mid-Eastern Athletic Conference championships in a row and six in the last eight years. On the football field, the Pirates have made five FCS Championship postseason appearances, as well as making five trips to post-season play as a NCAA Division II member. With the addition of Hampton, the Big South Conference will now have four members based in Virginia (Hampton, Liberty, Longwood, Radford), South Carolina (Charleston Southern, Presbyterian College, USC Upstate, Winthrop), and in North Carolina (Campbell, Gardner-Webb, High Point, UNC Asheville). The conference membership will begin exploring different scheduling models and championship formats for the upcoming 2018-19 season. For 150 years Hampton University has been THE Standard of Excellence in higher education. Founded in 1868 by Brig. Gen. Samuel Chapman Armstrong, Hampton University has a long successful history of offering a strong academic program of educating the “head, heart and hand,” and emphasizing the development of character. This foundation has been built upon by Dr. William R. Harvey, who has served as Hampton’s president for 40 years, during which time the university has experienced accelerated growth and achieved notable accomplishments. Founded in 1983, the Big South Conference is an exemplary leader in college athletics, dedicated to developing student-athletes through the pursuit of excellence in the classroom, community and field of play. The league’s growing presence as an NCAA Division I athletic conference is made evident by its multitude of athletic accomplishments, innovative marketing and media partnerships, increased television packages and most importantly, its commitment to fostering the academic, personal, social, athletic and leadership development of its student-athletes. Currently comprised of 10 member institutions (Campbell University, Charleston Southern University, Gardner-Webb University, High Point University, Liberty University, Longwood University, Presbyterian College, Radford University, UNC Asheville and Winthrop University, plus football members Kennesaw State University, Monmouth University and the University of North Alabama) sharing a common geographic region and similar academic values and purposes, the Big South’s remarkable history of achievement is characterized by the league’s 19 championship sports and the profound academic and life successes of its nearly 3,500 student-athletes. The Big South Conference: Where Winners Are Made.